More than 20 light years away lies a perfectly normal star. It is a red dwarf called Gliese 581. The mass of this star is 0.33 times that of the Sun, and 0.002 times the luminosity. At first sight, no agreements with our star you might think. Imagine yourself being in a spaceship towards this star. When we approach Gliese 581, we see six bright dots that rotate around her. These dots are planets, and some of them may contain life. We now focus on Gliese 581 g. This is the sixth planet in this system. 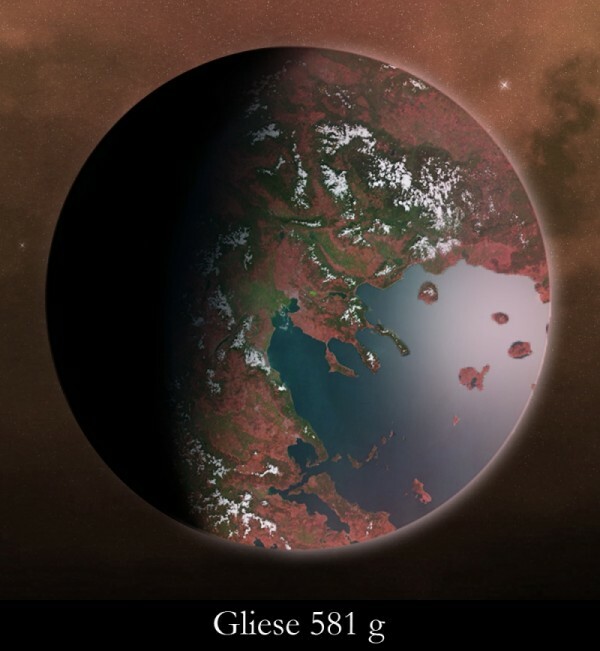 Gliese 581 g has a mass of 3 to 4 times that of Earth, and is 30 to 40% larger. This is probably a rocky planet with enough gravity to hold an atmosphere. One rotation of the planet around its own axis takes as long as one rotation around its star: a little less than 37 days. This means that one side of the planet is constantly turned to its star (like the Moon orbits the Earth). This Digital Impression is made in Photoshop CS5. It is the first time I’ve done this, but certainly not the last time. Thanks for watching! Nice drawing of your guess at the appearance. Long days and short years with that 37 day revolution about the star with one rotation, indeed much like the tidal lock the Moon has to Earth.